Nick Riley believes integrating physical activity into core school subjects can improve not only students' health but their behaviour and their academic performance. The idea that classroom learning and physical education can be complementary is the concept behind a novel PhD project being conducted by Nick Riley, a lecturer in the School of Education and researcher with the Faculty's new Priority Research Centre in Physical Activity and Nutrition. "There are lot of health benefits that come from increased activity and there is a lot of research that suggests that active children actually have the potential to perform better cognitively and academically," Riley says. Riley, who trained in physical education but spent 18 years as a classroom teacher in primary schools in the north of England, has developed a program called EASY Minds (Encouraging Activity to Stimulate Young Minds) as a research project. His program integrates physical activity into maths, English, science and HISE (history/social science) lessons. Riley has completed a feasibility study in one school and will repeat the program across four schools in a pilot study next year. For the initial study he went into a school three times a week over a six-week period and taught hour-long lessons in core subjects, employing physical activity as a learning tool. "If I was teaching multiplication, for example, rather than have the students do an exercise on paper, I might take them outside and time them running over 20 metres then get them to calculate how long it would take them to run 100 metres, or 90 metres, using that information," Riley explains. "Or, rather than measuring area and perimeter in a book, they might go out and measure the area and perimeter of the playground. "It's still a maths lesson but it integrates physical activity, and because the kids have ownership of the data, they are more engaged in the exercise." The children in the study wear an accelerometer, a device that records their activity levels, over the school week. The primary aim of the intervention program is to increase daily activity but Riley says it can influence classroom behaviour and self-esteem as well. While all children responded well in the feasibility study, Riley says integrated activity can be particularly beneficial for kinesthetic, or physically oriented, learners who are more inclined to become disengaged with traditional classroom teaching methods. "Often they are the kids who end up getting in trouble and get a reputation for being disruptive," he says. "I believe all kids have huge potential and as educators and teachers we have to find the key to unlock that potential." Riley believes integrating physical activity into core school subjects can improve not only students' health but their behaviour and their academic performance. Nick has consistently demonstrated teaching excellence and a commitment to quality teaching and learning across a diverse range of courses. He is a highly valued member of the School of Education, specialising in Primary School Health and Physical Education.He is also the Deputy program Convenor for Secondary Education (PDHPE). 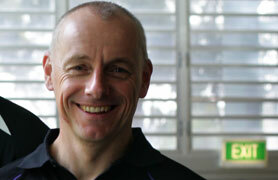 Nick has won numerous awards for both his teaching and dissemination of his research across NSW Public Schools. Primary School Health and Physical Education I currently teach/coordinate/ lecture on all primary school HPE courses at the University. Coordinator EDUC2747, EDUC6747, EDUC 2058 Teach EDUC2515,EDUC2515, PUBH1030. © 2016 Human Kinetics, Inc. To evaluate the impact of a primary school-based physical activity (PA) integration program delivered by teachers on objectively measured PA and key educational outcomes. Methods: Ten classes from 8 Australian public schools were randomly allocated to treatment conditions. Teachers from the intervention group were taught to embed movement-based learning in their students&apos; (n = 142) daily mathematics program in 3 lessons per week for 6 weeks. The control group (n = 98) continued its regular mathematics program. The primary outcome was accelerometer-determined PA across the school day. Linear mixed models were used to analyze treatment effects. Results: Significant intervention effects were found for PA across the school day (adjusted mean difference 103 counts per minute [CPM], 95% confidence interval [CI], 36.5-169.7, P =.008). Intervention effects were also found for PA (168 CPM, 95% CI, 90.1-247.4, P =.008) and moderate-to-vigorous PA (2.6%, 95% CI, 0.9-4.4, P =.009) in mathematics lessons, sedentary time across the school day (-3.5%, 95% CI,-7.0 to-0.13, P =.044) and during mathematics (-8.2%, CI,-13.0 to-2.0, P =.010) and on-task behavior (13.8%, 95% CI, 4.0-23.6, P =.011)-but not for mathematics performance or attitude. Conclusion: Integrating movement across the primary mathematics syllabus is feasible and efficacious.